Azul the largest airline in Brazil by the number of cities served, announces today its preliminary traffic results for May 2018. Consolidated passenger traffic (RPKs) increased 14.0% compared to May 2017 on a capacity increase (ASKs) of 13.5%. As a result, load factor was 80.1%, 0.3 percentage points higher than in the same period last year. Domestic passenger traffic increased 1.5% on a 2.6% increase in capacity resulting in a load factor of 77.1%, 0.9 percentage points lower than May 2017. This reduction was due to the truck driver's strike in Brazil, which resulted in a higher number of reservations cancelled and an increase in no-show rates between May 24th and May 31st". 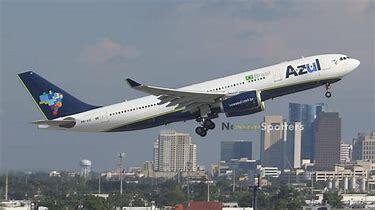 Year to date Azul continues to be the most on-time airline in Brazil with 91% of flights departing within 15 minutes of departure time, according to FlightStats.